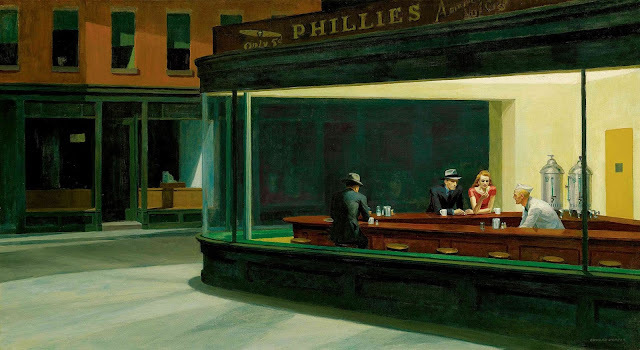 "Nighthawks" by Hopper, because as you are certainly aware, I am totally fascinated by city lights at night, and a little bit too by people you come accross as well.. so this painting has been fascinating to me for quite a while already... so when I came accross this very same scene at the Flatiron building, by night, I could not believe what I was seeing and the opportunity it was giving me for a picture, .... I'm still happy and grateful about it! For those who appreciate Hopper's work, don't miss the exhibition of his sketches and drawings until the 6th of October at the Whitney museum.